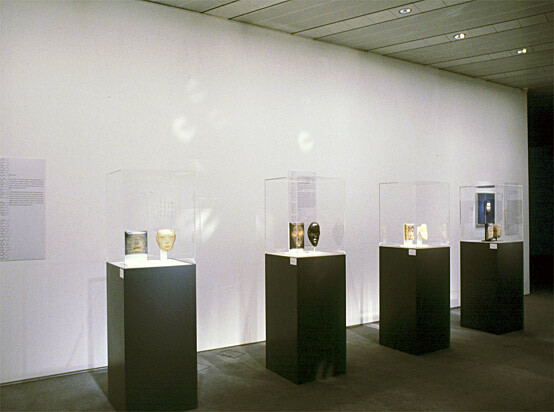 This exhibition was the culmination of a research project entitled The Transformative and Assimilative Uses of Art Objects hosted by the Sainsbury Centre for Visual Arts (SCVA) at the University of East Anglia and involving five artist fellows who were attached to the Centre for Applied Research in Visual Arts Education during the fellowship. 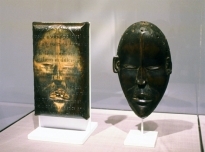 The Sainsbury Collection emerged alongside the increasing influence of Prmitivism upon the visual arts and reflects a burgeoning interest by Western artists in the arts of non-Western cultures, particularly those of the African and American continents and the Pacific Ocean Islands. 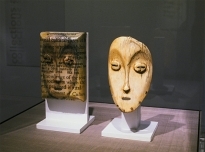 The very tangible presence of non-Western artefacts within the wider intellectual and cultural context of a contemporary University and its multi national student cohort became the focus attention for the project. 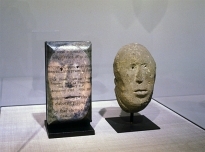 Initial research was both visual and academic and explored the relationship between non-western objects and a very particular contemporary European understanding of them (namely one based within the environment of Higher Education). 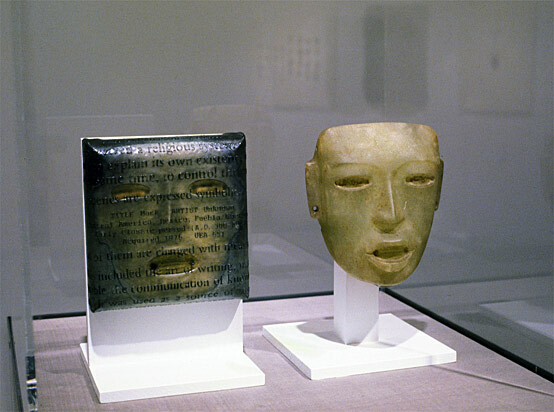 The resulting artwork focused on a series of African & Mexican masks and a heavily eroded three dimensional Gallo/Roman mask from France to was used to represent Western or European culture. The research infrastructure of the University was used to gather the responses of students originating from the same countries as the masks themselves. In particular one work incorporated the incisive comment of a French Moroccan PhD student (studying English) to the Gallo/Roman head. 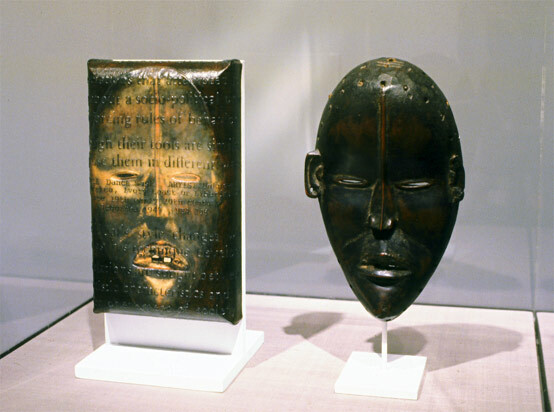 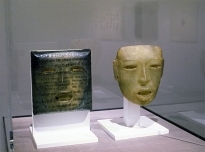 The Sainsbury Centre’s research library provided academic comment which was used to compare the distanced anthropological response to artefacts with the contemporary response of a person simultaneously linked to the mask by a common ‘provenance’. 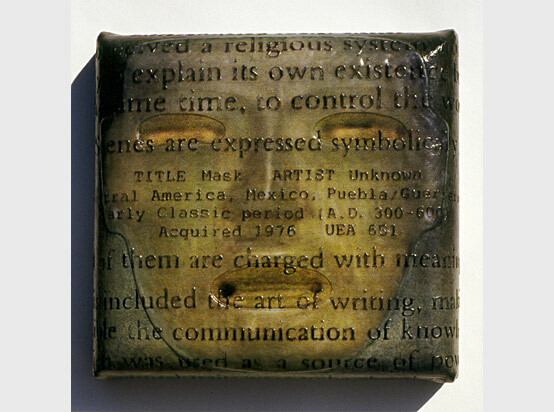 These textual commentaries were superimposed on to a photographic image of the original mask which in turn was laid on to canvas. The work commented on the archetypal western art format of painting as a support for images and ideas. The use of photographic imagery, mimicking the original masks and overlayed with text, questions our understanding and empathy for what we recognise as art. 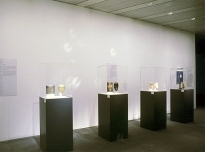 This point was further emphasised by exhibiting the paintings directly alongside the original objects themselves within museum standard cases. 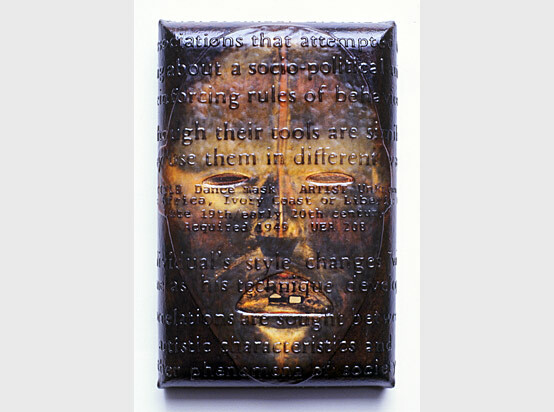 Ultimately image and text created layers of information, inviting the eye to shift between different ways of understanding the original artefact and its past and current context. The textual language of interpretation was overturned and became enmeshed within the image, with the combination of image and language used to demonstrate not otherness, but similarities between cultures. 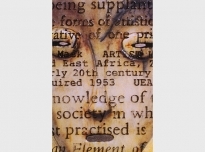 1 The research project was diretced by Dr. Veronica Sekules, Head of Education at SCVA and Professor Les Tickle from the School of Education and Professional Development, UEA.